A hobby first, the 407-card break for the complete 1952 Topps Baseball set will take place at VintageBreak.com's booth during the 2016 National in Atlantic City. Each card is professionally graded by PSA, including multiple examples coming in at NM-MT+ 8! This is an extraordinary opportunity to have a chance at owning some of the most sought-after baseball cards ever produced. Capped at the number of cards in the set, break spots are going fast and only a limited number remain. As many collectors are aware, 1952 Topps features the iconic Mickey Mantle card (#311). 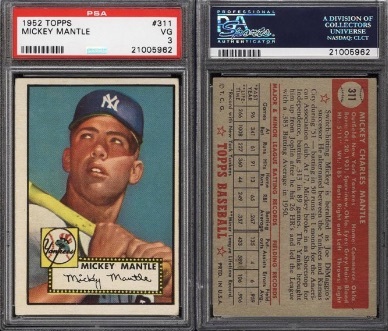 This particular Mantle is a beautiful PSA 3 with superb color and eye appeal and an estimated value of $30,000. All high-number cards are included in the break as well, with standouts like Willie Mays, Jackie Robinson, Pee Wee Reese, and one of the rarest cards in the set, Ed Matthews (#407). In addition to the 1952 set, VintageBreaks.com is also proud to offer the largest and most valuable memorabilia group break of all-time! Checking in with an approximate retail value of $140,000, some of the key items in this break include a Babe Ruth and Lou Gehrig dual signed photograph (PSA/DNA), a Thomas Jefferson signed Act of Congress (PSA/DNA), and a complete set of single-signed baseballs for all Cy Young Award winners from 1956 through 2014. 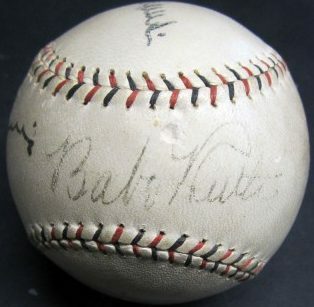 There are also more one-of-a-kind items like a Babe Ruth and Joe Louis PSA/DNA signed baseball, and a football helmet autographed by 37 former Super Bowl MVPs! Collectors must act fast as there are just a small amount of spots available for this impressive memorabilia break. "This is a special year for the National, and a special year for the Case Break Pavilion," said David Gelfman, host of the event. "With this year being the inaugural year of the Mike Berkus Main Stage, we wanted to do something so big, and so huge, that it would always be remembered. We couldn't think of a better way to honor our beloved friend and the one who started it all, than by giving collectors a chance to own some of the greatest sports cards and memorabilia ever created. In fact, you don't even need to be present at the National to participate in these breaks. Everything will be streamed online and the videos will be posted on YouTube for all to see." With multiple rare items valued at $25,000 or more, this is truly a chance of a lifetime for many in the hobby, and it will likely be a collectible fireworks show for the record books. For a complete list of items, break spot pricing and more information about how to participate, please visit VintageBreaks.com. All value estimates are provided by Vintage Breaks. Did this set break ever happen? Do you have future plans?